My dear neighbor and amazing gardener asked me if I would like some Kale….. I would never turn down Kale, so off I went to see how his garden beds are doing. I am so impressed by how beautiful his beds look, tomatoes, kale, squash, and look over there! I spotted 2 beautiful Rhubarb plants! 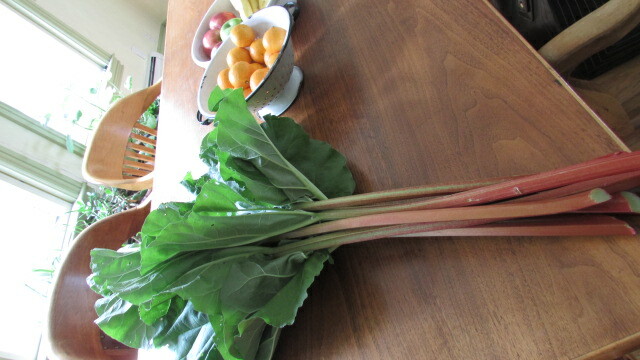 I asked if I could cut a couple stalks, I have some wonderful rhubarb recipes that I have been wanting to try. 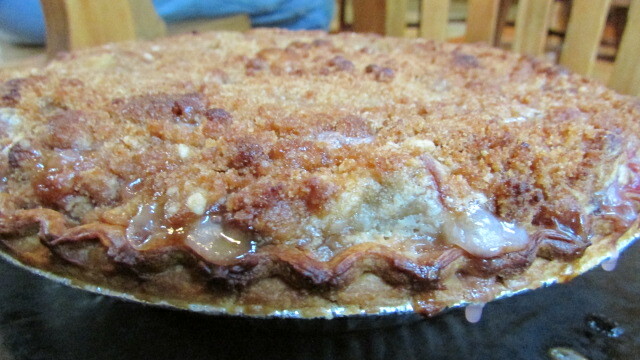 I quickly came home and chose a Rhubarb Custard Pie recipe that sounded wonderful. My son’s birthday is tomorrow and he always asks for Birthday Pie. I didn’t make my own crust this time, but here is my recipe for the best flakiest home made crust. Combine flour and salt in a medium bowl, cut in vegetable shortening with a pastry blender or two knives until mixture is crumbly. Sprinkle with water, blend until mixture holds together. Shape dough into a ball, place on lightly floured surface. Roll out dough to 1/8 inch thickness. Line pie plate with pastry. Turn edge under, crimp edge as desired. For the topping: Mix together the 1/2 cup flour, brown sugar and melted butter. Set aside. In a large mixing bowl, combine the diced rhubarb, sugar, 1/3 cup flour, and sour cream. Transfer the pie filling to the prepared pie crust. Sprinkle the topping over the pie filling. Bake the pie on the lower-middle rack of the oven at 450° F. for 10 minutes. Lower the heat to 350° F. and continue baking for 35 to 45 minutes more, until the filling starts to bubble. Let cool completely before serving. Serve room temperature or chilled. This looks fantastic!! Now I want some pie!!! lol!